Student representatives are an integral part of the Committee structure at the University. At the start of each Michaelmas term, each School Council and Faculty Board or other governing body elects student members, to represent student interests in shaping decisions at the local and central levels. Each School Council elects one undergraduate and one graduate member. Councils are generally concerned with the strategic goals of the Departments within their areas, and consider matters of resourcing, estates, new courses and regulations. The next elections for School Council members will be taking place on 27-28 November 2018, with nominations closing on Weds, 21 November 2018. All students will receive notification of the procedure for nominating themselves to run for election, and will be asked to produce a short manifesto which will be made available on this website. Each Faculty Board, Syndicate or other body elects a number of undergraduate and graduate students. Each body has its own scheme for election, so positions available will vary but there are usually 3-4 representatives overall. 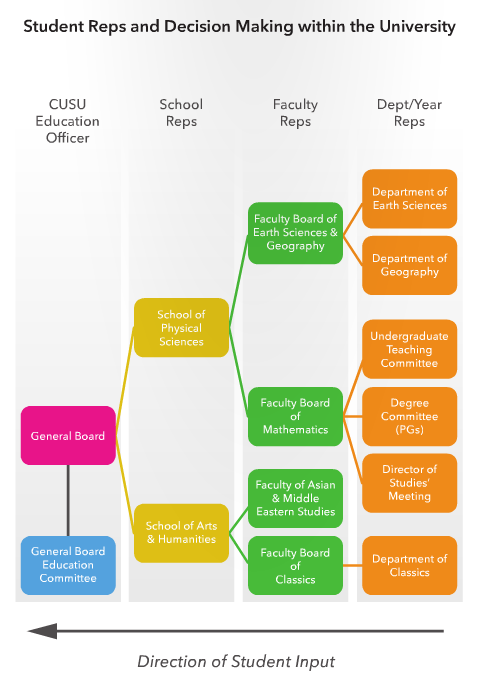 Due to the diverse structure of some Faculties, more representatives may be elected informally to represent each course or student group; these informal representatives feed into the formal Faculty Board representative structure in order to ensure sufficient coverage of all students' voices. Each body sets its own date for elections, but generally this will be either end of October or end of November 2018. If you are interested in representing students in your Faculty or School, you can get more information from CUSU, or from your Faculty or Departmental Administrator.